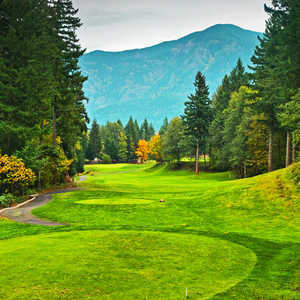 HOOD RIVER, Ore. -- If you believe in the notion that the simplest explanation is usually the correct one, it's easy to understand why Indian Creek Golf Course conditions are always among the area's best: General Manager Tyson Jacobs is also the superintendent. Indian Creek Golf Course's ninth hole shows off the scenic backdrop in Hood River. 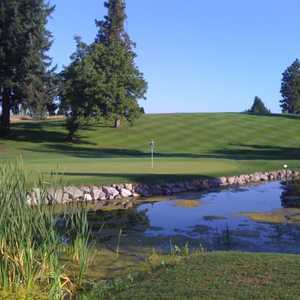 Reading player reviews on GolfNow about Indian Creek, located in Hood River less than an hour east of Portland along the Columbia River Gorge, superb conditioning comes up in the comments time and time again. "It had been raining all week before we showed up, and I can't count once I stepped in a muddy/soggy patch of fairway," remarked Flemishmafia, a 20-handicap from Portland after his round in April. Mark Gradin, head professional at Indian Creek, made mention of the fact greens were punched 10 days prior to my visit, but you could hardly tell compared to other courses in the area that all tend to aerate sometime in April. 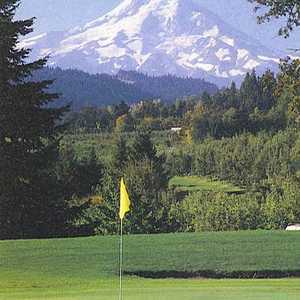 Indian Creek is a scenic, affordable parkland course located within the Columbia Gorge in Hood River, and on a clear day, nearby Mt. Hood towers over the course. Windsurfing is a popular pastime around this part of the river, so you can expect breezy conditions here that help add a little teeth to the 6,150-yard layout full of hills and water hazards -- not to mention gorgeous Cascade Mountain scenery and lush hillsides all around. The design has many shorter, target-style par 4s, where consulting your golf cart's yardage booklet is a must. In fact, not a single par 4 is longer than 400 yards (the first hole, at 395 yards, is the longest par 4 on the course), and eight of the 10 par 4s are less than 350 yards. But there is room to hit it out here. The par 5s -- particularly No. 9 (an uphill, dogleg left) and the rolling 16th -- are very strong holes, especially if you're into the wind, which seems to swirl out here around the gorge. Every par 3 is a postcard, starting with the fifth hole that plays from an elevated tee over a valley to an elevated green. No. 10 is a shot played straight downhill. It's just a chip shot at 133 yards, but the wind can really make you think on the tee box. No. 15, the last of the four here, is a classic-looking hole played with a gorgeous backdrop. Highly affordable and welcoming, Indian Creek G.C. is a great option for those passing through Oregon on a golf road trip taking in the spectacular Columbia River Gorge, whether they're headed south towards Mt. Hood out East even further. While on the shorter side, there are a lot of challenging shots to hit out here, thanks in part to the wind and an undulating piece of property. Higher-handicappers will appreciate the two forward sets of tees that play as close as 4,547 yards. Facilities at Indian Creek include a large pro shop, full driving range and practice green. This facility is also where Gradin, a PGA Professional, operates his "K-Vest" and Titleist Performance Institute instruction. The clubhouse is home to a full restaurant, Divot's, which has a menu full of sandwich, salad and appetizer options, including a delicious quesadilla and a handful of beers on tap, including Oregon brewery favorites Deschutes and Widmer Brothers. On a sunny day, be sure to grab a seat on the 19th-hole patio overlooking the golf course.